The top 12 teams from across the region competed in the Baywide Rippa Rugby World Cup, at Brood Park, in front of special guests: players from the Maori All Blacks and Black Ferns squads. Scroll down to view the full photo gallery. The Year 3-4 final featured Western Bay of Plenty's qualifier Te Matai School and Western Bay of Plenty qualifier Green Park Primary School. Te Matai took out the final in a tight 6-3 win. The Year 5-6 final featured Eastern Bay of Plenty's qualifier Kawerau South and Western Bay of Plenty's qualifier Maungatapu. Maungatapu Primary finishing off the day with a 7-5 win. 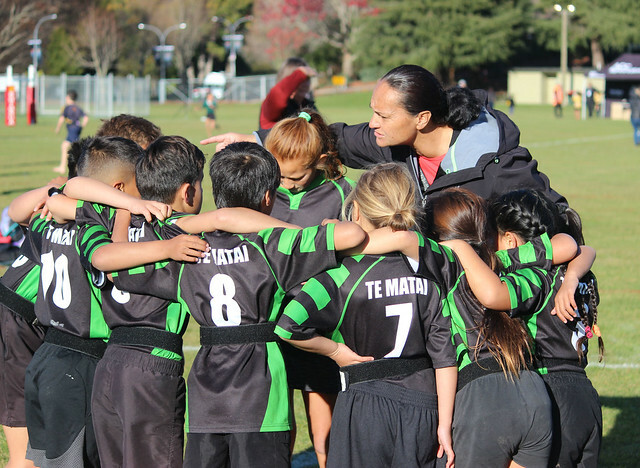 Maungatapu Primary Year 5-6 team will now represent Bay of Plenty at the Air New Zealand Rippa Rugby Championship in Wellington from September 18 – 19. Last year Baywide winners Kawerau South proudly represented Bay of Plenty finishing in third place at the National Rippa Rugby tournament. Brett Johnson, Bay of Plenty Junior Rugby Development Officer at Bay of Plenty Rugby, reflected on the day, saying, “What a buzz today has been, with the Black Ferns and Maori All Blacks coming down this morning to cheer on the kids, it was the perfect start to an awesome day out here - a combination of great weather, an awesome attitude from players, parents, supporters and coaches and great referees.